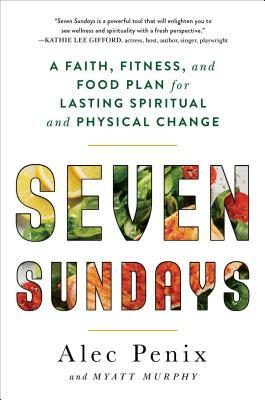 A Biblically grounded, six-week plan to lead you on the path toward losing weight and getting healthier by focusing on the connections between spiritual and physical health—“Seven Sundays is a powerful tool that will enlighten you to see wellness and spirituality with a fresh perspective” (Kathie Lee Gifford). In Seven Sundays, celebrity trainer and devoted follower of Christ Alec Penix explains the connection between faith and fitness, and shares both his own and his clients’ success stories. When our spiritual and physical bodies are built up simultaneously, we find ourselves more likely to stick with healthier, life-changing habits, appreciate what we have, be thankful for what we’ve gained (and lost), and feel content with how far we’ve traveled. Seven Sundays is a six-week program that shows you how easy it is to undergo your own total transformation. The book is organized as a day-by-day journey in the same manner as a daily devotional. Over the course of each week, you will work on the “6 Pillars of Purpose” that build up this strength. You will also enjoy “Faith-Full” foods and explore a new spiritual theme each week. Ultimately, you’ll undertake a meaningful journey that will finally connect your body and spirit. Seven Sundays is sure to “inspire people to become the best version of themselves, through strengthening their body, mind, and spirit” (Roma Downey, actress, producer, and New York Times bestselling author of Box of Butterflies). You’ll learn to embrace the fact that you deserve to exercise, eat right, and be healthy, and recognize your body as a spiritual vessel. Alec Penix is a celebrity trainer in Los Angeles. Soon after he was saved, God put the intention in his heart to combine faith and fitness so he could share his calling. Alec has worked with many athletes and celebrities, including Olympic Gold medalist Gabby Douglas, singer/songwriter Natasha Bedingfield, actor/singer Aaron Tveit, and Derek and Julianne Hough. He has worked on international concert tours, musical productions, and on set for both television and film to help prepare his clients to look, feel, and perform their best. He lives in Los Angeles. Myatt Murphy is a journalist who has written for many of the world's top publications, including Better Homes and Gardens, Men's Health, Women’s Day, and Cooking Light. He is the author of many best-selling books—including The Body You Want in The Time You Have, Ultimate Dumbbell Guide, and the Men's Health Gym Bible—and has also written books for many of today's top lifestyle specialists, including Harley Pasternak, Gunnar Peterson, and Jenna Wolfe. “Seven Sundays is a powerful tool that will enlighten you to see wellness and spirituality with a fresh perspective. Alec is so much more than a trainer, he is a coach who is dedicated to changing the way you see yourself by incorporating practical steps that will empower you. His love of God and wanting to help people will touch many lives!" "Alec is a dedicated young man who’s passionate to inspire people to become the best version of themselves, through strengthening their body, mind, and spirit." "Christian readers looking to maintain faithfulness and healthy habits will find great advice in this approachable work."